Rachel Keen (published under Rachel Keen Clifton from 1966-2002) was born in Burkesville, a small town in rural Kentucky. She received her B.A. from Berea College in 1959 and her doctorate from the Institute of Child Development, University of Minnesota, in 1963. Her dissertation was on newborns’ discrimination and habituation to tones, using nonnutritive sucking as the response. She was awarded an NICHD postdoctoral fellowship to study newborn behavior using psychophysiological measures at the University of Wisconsin under the mentorship of Frances K. Graham. This experience determined the direction of Keen’s research for the next decade, as she investigated infants’ habituation, conditioning, and the orienting response using heart rate change as the primary measure. Graham and Clifton extended Sokolov’s concepts of orienting and defense in a 1966 Psychological Bulletin article that became a Citation Classic. The 1960’s were a heady time to study newborn behavior because only a handful of researchers were beginning to explore infant development after a hiatus from the 1940’s. Keen’s presidential address “Lessons from Infants: 1960-2000” to the International Society on Infant Studies (Infancy, 2001) reviews this early research. One of the more startling discoveries made was that newborns remained habituated to auditory stimuli they had been exposed to 24 hours earlier (Keen, Chase, & Graham, 1965), a finding she replicated many years later using speech stimuli and a behavioral response rather than heart rate (Swain, Zelazo, & Clifton, 1993). Long-term memory is now well established in newborns but in 1965 it was a novel idea. Keen pursued a special aspect of auditory development in infants called the precedence effect, which refers to echo suppression. Speculating that cortical development was necessary, she showed that the precedence effect was not present in newborns but had developed by 4 months of age. During this developmental work, she discovered a new phenomenon (later termed the Clifton Effect) that she and Richard Freyman followed up with numerous adult studies demonstrating cognitive influence on echo suppression. Keen was made a fellow in the Acoustical Society of America for this work. In addition to the research on audition, Keen studied the perception-action loop of vision and reaching in infants. In a longitudinal study she found that when infants first began reaching for objects, they were also able to reach and grasp sounding objects in darkness. In the 1990’s and beyond she concentrated on cognition as well as perceptual-motor development, summarizing much of this work in a prefatory chapter in the Annual Review of Psychology (2011) on problem solving. Honors for her research include the Distinguished Scientific Contribution Award from the Society for Research in Child Development, the Distinguished Alumna Award from Berea College, and the Distinguished Faculty Award from the University of Massachusetts. 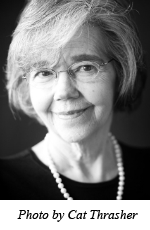 She received an honorary degree from Uppsala University, Sweden, and was elected fellow to the American Academy of Arts and Sciences, American Association for the Advancement of Science, and the American Psychological Association. She held a Research Scientist Award from NIMH from 1981-2001, and a MERIT award from NICHD from 1999-2009. Rachel Keen spent most of her career at the University of Massachusetts (1968-2007), and then at the University of Virginia (2007-2012), where she is now Professor Emeritus. * The FABBS Foundation would like to thank Dr. Robert Feldman, Nathalie Goubet, and Daniel D. McCall for nominating Dr. Keen for this honor and for leading the effort to spread the word about her nomination. Would you like to honor Dr. Keen? It’s not too late to have your name added to the list of donors! You can make your donation to Dr. Keen’s In Honor Of… campaign at anytime.